Year-Round training for your players! Challenger can provide your soccer organization with qualified and trained International coaches throughout the spring and fall seasons. Challenger has hundreds of coaches who can either be rented for the season, or we can provide professionally run training programs as an add-on to the club’s current coaching structure. The most successful youth teams throughout the world all receive regular well planned Training Sessions which follow a consistent philosophy to develop their players. The CHALLENGER SOCCER ACADEMY offers your organization access to this support via our International Coaching Staff and Soccer Programming that combines the best Professional Youth Academies Curriculums, Drills, Practices and Training with our PLAY, TRAIN, COMPETE, philosophy! Our Academy Directors can provide your players with the opportunity to receive high level training throughout their season in supplementary practices designed around the drills, practices and games used in many of the world’s top youth academies. Our goal is to develop and improve each individual player’s technical ability, their understanding of the game, and their effectiveness in a game situation. Each of your teams will see a direct improvement in performance and your organization will have provided exactly what the players need, but often do not get without employing an expensive coach on a year round basis – a high level and effective player development training program. Challenger’s Academy division has grown significantly in the past 5 years mainly due to our ability to recruit, train, deploy and manage a significant number of trainers for local soccer organizations who do not want to have to deal with the many headaches involved with employing a team of full time coaches. Our International coaching staff live and breathe the game and are available for hire as Trainers, DOCs and Age Group Coordinators to run weekly practices, or become a head coach of the team. Our coaching staff will share all their expertise and experience with the players to maximize their potential. We strive to become key role models, positively impacting each players’ skills and lives. Challenger staff can also deliver in-house Coaches Clinics and Coach Education, mentor and provide support to all of the current organization’s coaching staff and if needed provide formal assessments of coaches. All our Programs are designed by our own child development experts and coaches with a goal of improving your players skills as well as their personal characteristics in line with the NAIA CHAMPIONS OF CHARACTER. Aimed at players who want to take their game to the next level! Our International coaches offer professionally organized practices that focus solely on individual techniques and skills that will fast track your player(s) game to new heights! This program is administered, coached and refereed by the professionals from Challenger Soccer Academy! One training session and one game a week with a focus on individual technical development within a small-sided environment. A FUNdamental Introduction to the game of soccer for players aged 2 – 5. Introductory skills of soccer through fun games, stories and music in weekly classes lasting 45 – 60mins each. Click here for more information on our TinyTykes Program. During the Fall, Winter and Spring Challenger Soccer Academy brings the nations most popular soccer camp to you. Why should the summer have all the fun join us on the national holidays and school breaks for a day or a full week of intensive soccer! Our Academy Curriculum has been based around the WORLDS TOP PROFESSIONAL SOCCER CLUBS and has been adapted and designed by our very own soccer and Child Development experts. Taking the core of the top training sessions and incorporating our PLAY TRAIN COMPETE PHILOSOPHY along with the US SOCCER FEDERATIONS tactical, technical, physical and psychological (TTPP) components of the game we have designed a curriculum that will develop both your players and the individual. Players will be able to perform the correct techniques and copy with the physical demands of the game as players adapt to different match conditions. Players will learn tactics, perform under pressure and understand the importance of match preperation as they begin to challenge themselves to improve. Players will focus on technical proficiency in a competitive environment. Small group tactics will be introduced along with a focus on SAQs. Players will focus on ball familiarity and develop a passion for the game. Basic concepts and strategy will be introduced along with our NAIA Champions of Character. Players will focus on the FUNdamentals of the game. We will introduce basic soccer skills through fun stories and games with a focus on the basic core and motor skills. 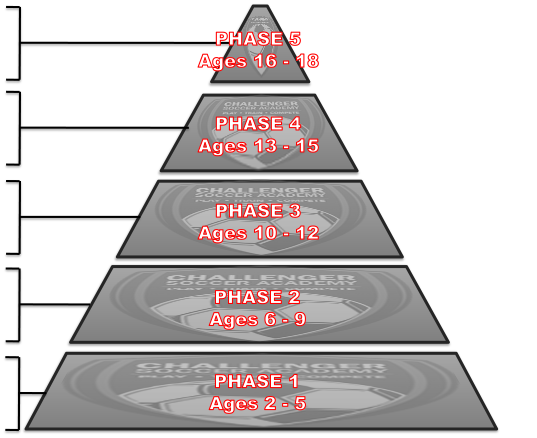 We have spent time studying the Youth Development pathways at Professional Soccer clubs throughout the UK, Europe and South America and in using this as a basis our soccer coaches and youth development experts have designed a curriculum that focuses on the key phases of soccer development. Our Philosophy incorporates what we are all about. Our goal as a company is to offer players, teams and coaches the opportunity to learn and develop their skills. We feel that these three major concepts can be used to aid the development of each from early beginning stages through to serious competitive players and coaches. The best teacher of the game is the game itself. Our Academy Staff create environments which encourage, creativity, experimentation, enjoyment, fun, a quality learning experience and a love for the game. This area of development is aimed at players from the ages of 2 through 5 who are new to the game of soccer and formulating the building blocks along with a love and passion for the game. Our Academy Staff train your players technically and tactically over the course of the season, implementing professional training sessions developing their skills and preparing them for future challenges and competition. This area of development is aimed at players from 6 through 14 and its focus is based on high quality coaching sessions offering and working towards a technical proficiency and a desire to improve. Our Academy Staff will develop your players current levels from a technical, tactical, physiological and psychological standpoint as your teams improve to compete at State, Regional and even National Levels! This is the pinnacle of our philosophy and is aimed at challenging players aged from 15 through 19 to be the best that they can be and preparing the players for college and further playing experiences. As Challenger Sports continues to expand our footprint overseas, we are very excited about the opportunity it now gives us to recruit talented and enthusiastic coaches from other countries! The Challenger coaching staff now boast an incredible team of coaches from Australia, New Zealand, Holland, Brazil, USA and Canada as well as our traditional team of Brits from England, Scotland, Northern Ireland, Ireland and Wales. This diversity of experiences and cultures reflects the truly global nature of the sport and this international team of coaches all have one thing in common — a genuine interest in helping with each player’s development and providing memorable and positive experiences through soccer. All applicants go through a detailed recruitment process including interviews, coaching sessions, personality tests and background checks before they are selected to work for Challenger. In addition to their coaching qualifications, Challenger staff are trained with the current First Aid procedures, Child Safety, Safe Haven courses, and Injury Prevention.